Posted on October 7, 2015	by Ken W.
Today, after 2 days of reading, worrying, procrastinating, and practicing on scraps, I made the bend! I bent the HS-810 and HS-814 ears to exactly 6 degrees, using my homemade go-no-go gauge. Van’s Says make the gauge out of cardboard. But, I happened to have a scrap piece of laminate laying around. And, it seemed like the perfect material for this. 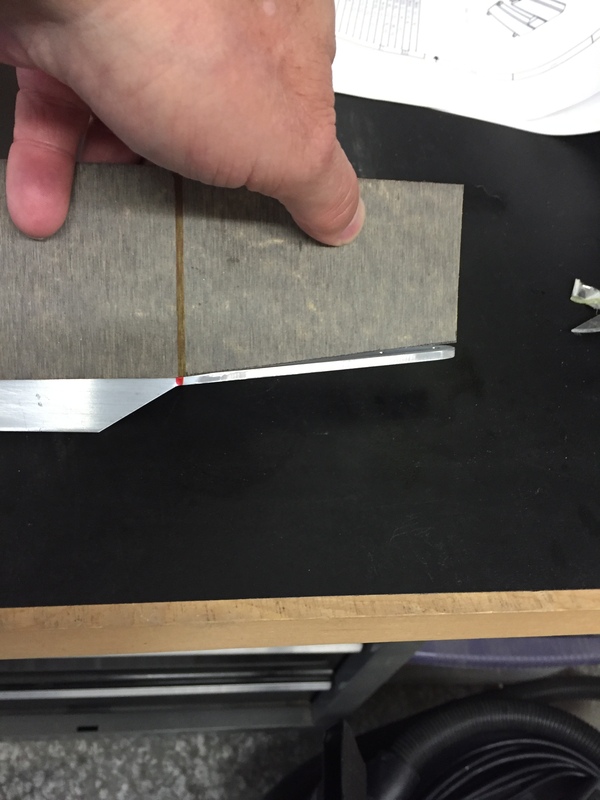 I used a good old nav-plotter to lay out the 6 degree angle on the laminate piece, then cut it with a band saw. And, I smoothed out the cut with the deburring wheel on my bench grinder, checking it for straightness on my counter top. It worked like a charm and the whole thing was pretty much a non-event. 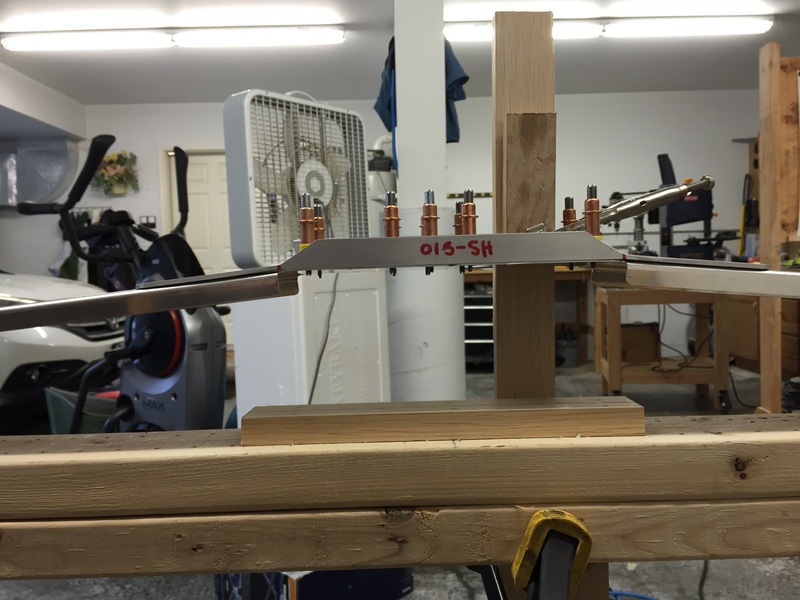 I also relieve the flanges at the bend lines on the HS-702 front spar halves, then bent them to match, using a block of wood and a pair of vice grips on the edge of a work table. Not much. But, that’s as far as I go until I worry over the plans and drawings for the next part of the puzzle. I’m also going to include the front spar reinforcement from Van’s service bulletin (SB-14-01-31). 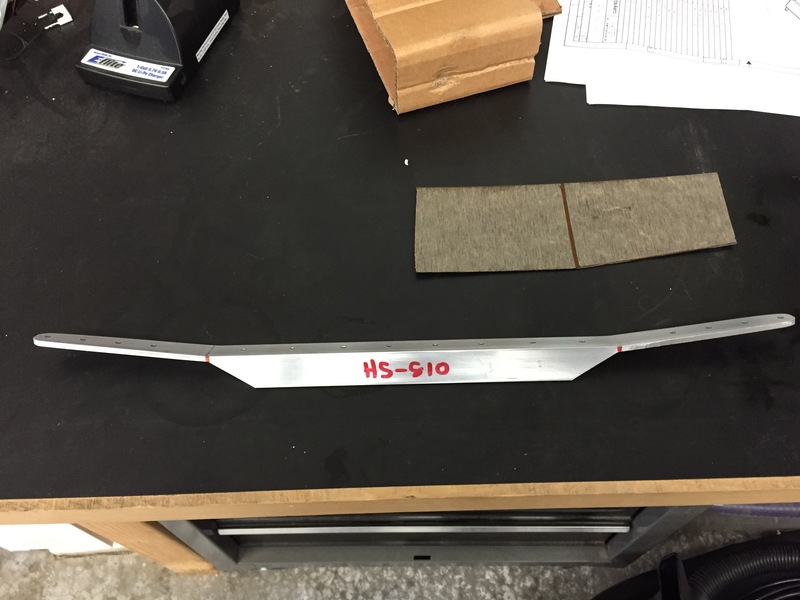 Measuring the bend angle on one side of the HS-810 with hand-made “go-no-go” gauge.